Technically Cool Computing (TCC) is a computer ergonomics learning activity module for students developed by members of the Puget Sound Human Factors and Ergonomics Society (PSHFES). The TCC module teaches students how to evaluate their computer workstations and work habits in order to reduce their risk for musculoskeletal injuries. TCC is a user-friendly learning module that can be easily implemented by teachers or other volunteers to provide tools for lifelong habits of safe computing. This video will guide you through using TCC. Up to 58% of middle school-aged children have pain associated with computer use. Additional research suggests that pain in childhood may be a predictor of future discomfort and an increased risk of injury in adulthood. Studies have also shown that children’s body postures are awkward while using computers in part because most equipment and furniture does not fit their small and ever-changing stature, which can increase their risk for discomfort and injury. There is good news! Many studies have shown interventions, such as posture education and furniture that fits kids’ smaller bodies help reduce discomfort, much the same as in adults. 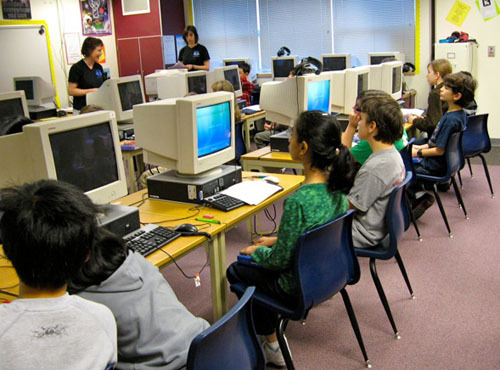 Pilot studies of the TCC program resulted in 100% of students able to recognize risk-producing postures and also successful in correcting awkward postures at their classroom computer workstations. Download this informative brochure to share with students and others on texting facts and how to minimize your risk for injury. Information presented in the TCC program is considered public information (unless otherwise noted) and may be distributed or copied for non-commercial purposes. Use of appropriate citation is requested. PSHFES provides no warranty, expressed or implied, nor or assumes any legal liability or responsibility for the accuracy, completeness, or usefulness of any information, apparatus, product, or process disclosed.